Seating "IceBerg" Elements, Co-Working Tables, Couches, Terrace Turf Hills, Shade Awnings, Fountain, Rope Wall, Shipping Container Meeting Rooms, Machiche Meeting Tables, Communal Lunch Counters, Machiche Meeting Table. 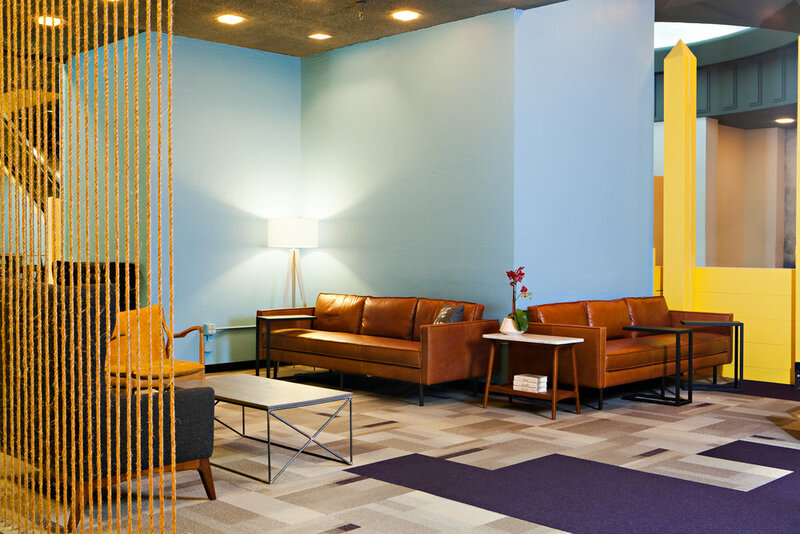 Revitalizing the Kaiser Center in Oakland by Lake Merrit to be a vibrant co-working space, we needed an energetic and captivating entry. The main entry pops full of color with our in-house designed and fabricated furniture we termed "The Icebergs". Designed to draw people into this main entry and allow a variety opportunities in seating, meeting & congregating. From standard desk sitting, standing desk height, to casual lounging, we designed this front lobby seating to serve any need. Joel Schwartz - Because We Can lead fabricator - builds the "Iceberg" from the inside out. The fasteners for the Icebergs are all on the inside, creating a clean aesthetic on the outside. We created a script in-house to be able to make these "Iceberg" shapes quickly and within budget. Sending the forms through the script, the panel separation and fastener placement became automated. Joel Schwartz - Because We Can lead fabricator - builds the "Iceberg" and then tries out the final product. Comfy! After sending the forms through our script, we are given sheets of panels and fasteners to cut out at our shop, making the whole process fast and efficient. The first floor has hopscotch & shuffle board dyed into the striped, multi-colored floor; a sea of white, articulated seating and tables are found along the 120 ft. long graffiti mural by Sean Griffin (Griffin One). In the center of the 1st floor, we created a large fountain with surrounding bench seating. This splashing water makes a nice amount of white noise, solving sound issues in this large open space. The floor plan of the first floor. From this image it is easy to see how large the space is. We fit 3 shipping containers in just one of the hallways of this floor. Programmable LEDs are integrated into the fountain, highlighting the water as it trickles down the center steel beams into the pool. On the first floor, the open co-working space is filled with the articulated 'IceBerg' seating, stripped floors and a dramatic, full wall graffiti mural. The mural in progress. The center is a "Porthole" - referenceing the facility's name "The Port Workspace"
Vibrant shipping container-meeting rooms line the large hallways. Along side the shipping containers is another larger lounge made for more casual work and meeting space. Bringing the containers into the space was no small job. Specialty movers and equipment were used to assure the floor was not dammaged, as it had just been re-done. Pinball and video games are found around the corner, three shipping containers turned into conference rooms line the hallways. A dividing wall made of rope helps separate out the large space. Brightly colored shipping container conference rooms with sliding doors now fill the large hallway. Part of the first floor had been a resturant. This old walk in freezer room was left with the original walls. Carpeting was added along with some nice furniture and fixtures to make a very unique meeting room. The 2nd floor floor layout for large areas of open desk co-working. The 2nd floor of this space used to be a server farm room, so it had no windows for natural light. By adding trees, smart daylight lighting and natural wood materials, this is now a great space to work. The view here shows the center tree in the space that is great for way finding and adds that bit of nature. The third floor of the Co-Working space looks out onto a tree filled roof garden. Bright windows light the sea of large worktables created for this room. Rolling co-working tables designs and fabricated by BWC fill the 3nd floor open co-working area. Table legs parts ready for assembly at our in-house shop. The once bar of the upstairs restaurant has been re clad and painted. New carpeting and fixtures have been added to this area, so we were able to re-use the existing infestructure and turn this into a now communal coffee/ bar area for the open co-working space on this floor. The third floor is now filled with large communal tables, private booth seating and a bar that leads into a spacious lounge area. Wall murals by muralist Amber Iwata. Furniture by Because We Can. The birds wall mural continues into the next seating area, another custom made couch piece by Because We Can. Our roof deck design transformed a once harsh concrete space to a wonderfully lush feeling patio. Planter boxes were added to this once concrete landscape of the roof deck. Tiki bar, Turf floor, Turf Hills, Lounge Seating and more, how could you not have fun up here! The initial plan designs for the hills, and the hill skeleton in construction. We made them much taller and lounge chair like in the final design. We used the same astro-turf for our grass hills as we did for the ground, creating a seemless feel of lush areas to relax on. We designed an awning hanging system in red and white. The brackets add angles to the awnings allowing for different sun/shade options and visual interest. The roof deck with all its fun and relaxing ammenaties works perfectly for parties and office gatherings. The second floor bar is a place to meet in and chat in the Co-Working space, or just to grab a snack and some coffee. The second floor Co-Working is a dark wood, plush carpeting and light filled space with large work tables. Tables designed & fabricated at BWC. The first floor has so many different kinds of meeting areas, from dedicated offices, reserveable meeting rooms and a sea of 'icebergs'. The street entry view at night is a vibrant and captivating visual that draws their customers inside and creates intrest from passers by. A driving necessity behind The Port's design was to offer many different types of working environments within one large space. This once defunct shopping mall was turned into a three floor co-working facility. Catering to the young entrepreneur, the space offers various exciting work surfaces, visually stunning murals and custom-designed wall paintings done by local artists. The renovations cover a once very bland and very monotone space with art, color and striking sculptures. The campus for The Port Workspace is 60,000 sqft. of the Kaiser Center (formerly a mall downstairs, restaurant upstairs and old office space). Responsible for the architecture and interior design on all three floors of the space, we used own in-house fabrication team, as well as a larger diversified team of local artists to bring in some huge wall murals, bright, colorful floor staining, and large sculptural pieces. 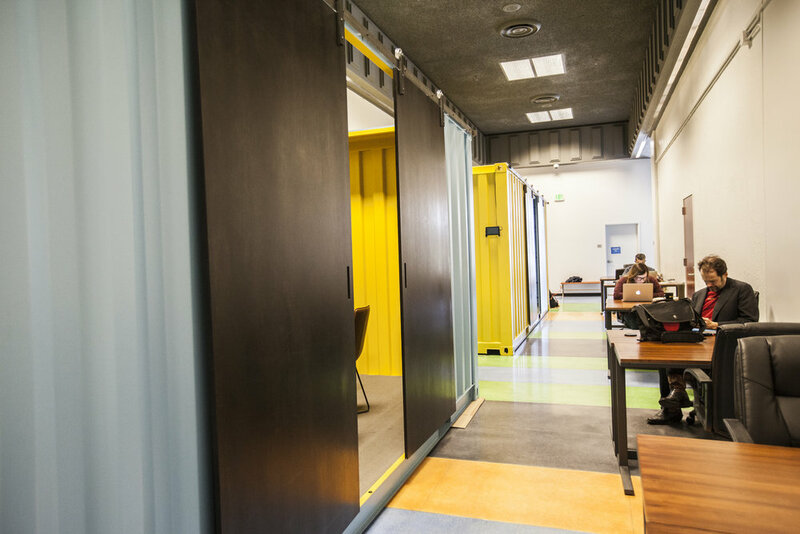 We innovated creative solutions for room dividing, such as rope walls, shipping container meeting rooms, and the inclusion of live, lush plants throughout the space. It is truly a complete package that feels good (and looks really cool)!